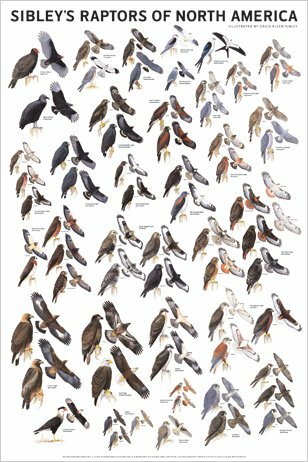 Beautifully illustrated and well executed, Sibley’s Raptors of North America is a perfect decoration for nature centers, birders’ homes, and any other place where people are interested in identifying the hawks, falcons, eagles, and vultures that they are likely to see anywhere in the United States and Canada. But don’t take my word for it – check it out yourself! Like Sibley’s Backyard Birds poster Sibley’s Raptors of North America measures two feet by three feet and will be a welcome addition to the collection of anyone who likes birds. The price of $29.95 might seem a bit steep but considering that the poster is essentially a work of art – comprised of 134 illustrations of 30 species – it is well worth the price. Get it for the birder in your life or for your local nature center. I can promise you that they will thank you sincerely. *Full disclosure: Scott & Nix sent me a review copy. 30 bucks doesn’t sound steep at all. It’ll cost ten times that to frame it properly, of course! $30 is reasonable, but this would be really cool as an iPod/ iPad app that I could take wtih me outside.